I am working on building up some dregs and was curious about my process. I made some 1.040 wort and cooled it down in my sink. Then I drank the first bottle of a beer called “future knowledge” and left a small amount of beer in the bottle before I swirled it around to get the remaining yeast off of the bottom. I poured those dregs into my flask and set it on the stirplate, turned it on high for about 30 minutes while I drank the bottle. Before I poured the dregs I spayed a paper towel with isopropyl and cleaned the top of the bottle. 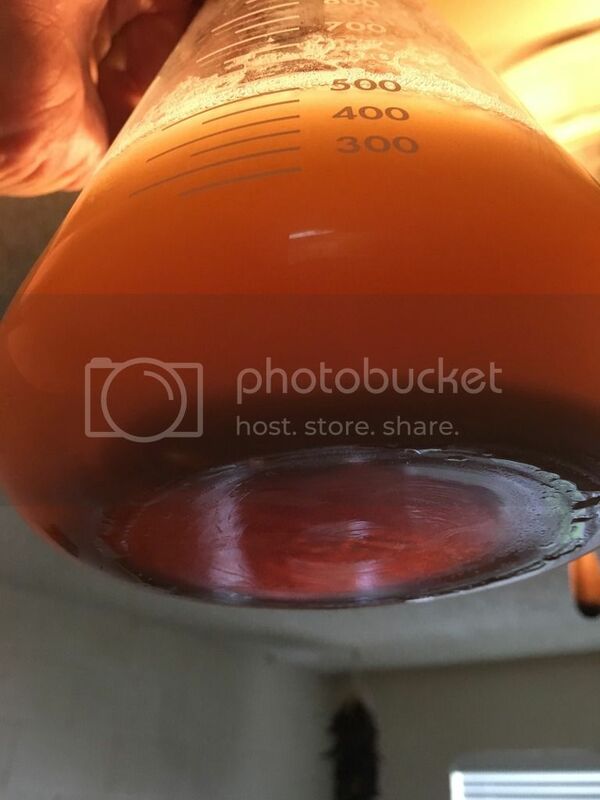 I have about 3/4 inch or head on the starter so I poured the 2nd bottle of future knowledge and and left the dregs, swirled it around, wiped the top, and poured them into the flask on the stir plate. I’m trying the build the yeast and Brett up by Friday. At this point I’m at a wait and see moment. Am I ok? Not okay? I’ve only built up dregs once before but used 3 bottles from beer I made myself. Should I keep my stir plate on? Continuously shake my starter? Looking for advice and feedback. Future knowledge - farmhouse golden ale, farmhouse microbes with lab-isolated brettanomyces, and House-mixed culture yeast. I’m not really worried about the Brett because if it’s there eventually it should just eat away at the sugars. Right? It was a 500ml starter. I plan to decant and make another one in a few days. Should I leave it stirring on the plate? And at what speed? Usually I just crank it up for a while and then turn it off, let the yeast reproduce, that kinda thing. Normally when I make a starter I have like 200billion cells. This is only my second run with dregs. I figure if you leave it cranking for 24 hours, you'll maximize growth, it will stay in aerobic growth rather than fermentation. In 500mL, I believe you'll max out with about 100B cells, like starting with a regular pack of yeast,maybe less than that, I can't find my references right now. So then do your regular starter. That's how I've done dregs, again with good results. The complaint you hear about leaving a starter on the plate for the duration, especially from advocates of SNS, is that the starter wort tastes funny. Fair enough. At this stage, I wouldn't care about that, you just want as much yeast as you can get, to then do a starter by your preferred method. As for the Brett, I'm thinking the same as you. Don't really want to grow it in proportion now, do you? EDIT Sorry, way off. 500mL will probably max out around 15B cells. I was thinking what I have after my second stage. Going by data in the White and Jamil book. I figure if you leave it cranking for 24 hours, you'll maximize growth, it will stay in aerobic growth rather than fermentation. Doesn't the Crabtree Effect state otherwise? Good catch. To clarify, it will stay in the growth phase as long as possible. So a good tactic at this stage of propagation. So it sounds like I need to decant tomorrow and then do another starter, leave it cranked tonight and tomorrow, cranked after tomorrow’s starter, and then do one more growth before the final pitch. Can you explain this? I’ll look it up, I just have never heard of it before. The Brett is there, I’m more concerned about growing the farmhouse and house mixed culture, although I think what I am doing will grow everything. Crabtree TLDR: at some point it will start fermenting even when fed oxygen. Yeah, I find the 500mL from dregs, decanted to a 1-2L starter (stir, shake, O2, what have you) yields the functional equivalent of a vial or smack pack, which you can make a final starter from. And you have plenty of time to do it by Friday. Dude, BTW, you do some crazy experimental brews. Kudos. I’m all about trying different and non conventional. I’m still in early stages of learning and the more I push myself the more I learn. I was going to try that coolship but I’m gonna have to wait till it’s not raining every other day (and when it’s cooler at night), plus I was reading a book about sours “American Sour Beers” and it recommend lactic acid, and I didn’t feel like dying of ecoli. This beer, used from dregs is going to be 4# rye, 4# pils, 4# flaked wheat. Usually when I go out of town I look for unique, and I build on that. I’m probably going to cut that stir plate when I go to sleep, and start over rebuilding when I wake up, do that for a few days. Hope it doesn’t rain this Friday. I'll let S. Cerevisiae do it, since he explains it way better than I can. The thing that confuses most people is that yeast cells have two separate metabolic pathways. The first metabolic pathway is called the respirative (aerobic) metabolic pathway. The respirative metabolic pathway is extremely efficient. It basically converts sugar to water and carbon dioxide gas. The second metabolic pathway is called the fermentative (anaerobic) metabolic pathway. It is the pathway through which sugar is converted primarily to ethanol (which is a carbon-based compound) and carbon dioxide gas. The fermentative metabolic pathway is not anywhere near as efficient as the respirative metabolic pathway. Many older home brewing texts erroneously refer to the growth phase as respiration. Brewing yeast cells do not respire in beer wort due to something known as the Crabtree Effect. The Crabtree Effect states that yeast cells will favor fermentation over respiration when subjected to dissolved glucose levels above the Crabtree threshold, and they will do so even in the presence of dissolved oxygen (O2). The Crabtree threshold is around 0.3% weight/volume (w/v). To put things into context, the extract from the average mash contains roughly 14% glucose, which means that wort with a specific gravity above 1.008 contains a glucose level above the Crabtree threshold. A 1.008 solution is a 2% sugar weight/weight (w/w) solution, which is the same thing as w/v when dealing with a solute dissolved into water because 1ml of water weighs one gram. Of that 2%, only 14% is glucose; hence, 0.02 x 0.14 = 0.0028, or 0.28% glucose w/v, which is below the Crabtree threshold. 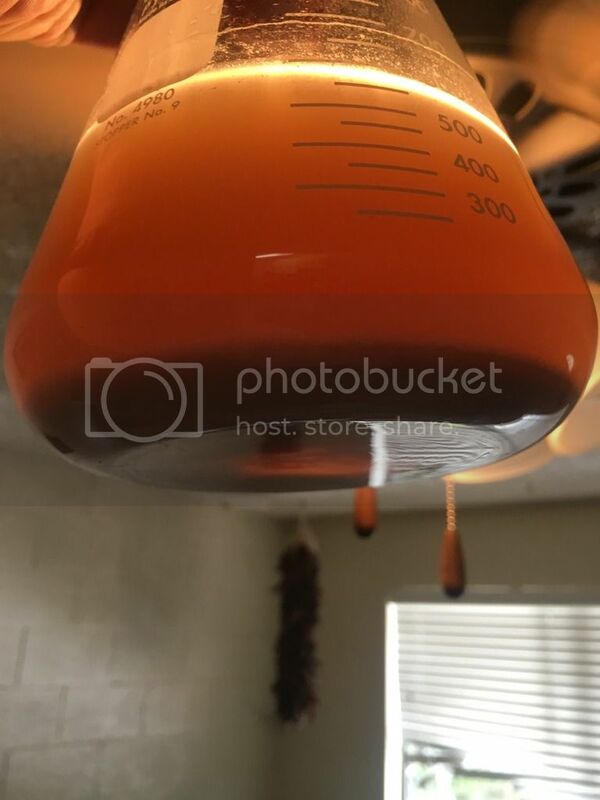 As all beer and batch yeast propagation worts have specific gravities above 1.008, yeast biomass growth in brewing is fermentative. Now, the metabolic pathways in yeast cells are a little on the leaky side. What yeast cells do while there is still O2 in solution is shunt a small percentage of the glucose being consumed to the respirative metabolic pathway for the synthesization of ergosterol and unsaturated fatty acids (UFA). These compounds make cell membranes more pliable, which, in turn, make passage of nutrients and waste products in and out of the cells easier. Here’s what I have so far, a considerable amount of yeast, much more than what I started with. What what I gather about this crab tree effect, is that it’s best to have yeast in an aerobic state when you are trying to grow the cell count, because in an aerobic state the yeast will eventually start to ferment. Correct? Whereas if I just turned the starter plate on for a short period I would retain a smaller yield of reproduction from the yeast because it’s in a more anaerobic state and the yeast doesn’t reproduce as fast. Does that sound right or am I confusing myself? Thank you for the help. I’m about to decant and pitch fresh wort, this time with some yeast nutrient, I forgot about using some last time. AFAIK, Crabtree is only about the presence of glucose, not whether it's aerobic. I figure the first stage you've just done is where you're most concerned with maximizing and hastening growth, as you start with so little. Your flask looks like it's got about as much as I'd expect IME. You can probably just go with whatever your SOP is through a couple of starter steps now and have a good pitch. And a fresh, healthy pitch which is most important. And yes, Crabtree effect is about glucose. As long as yeast have a critical amount of carbon available they will at some point stop respiring and go anaerobic. Producers of dry yeast prevent Crabtree and keep yeast in aerobic growth by using a continuous or fed-batch process, constantly adding tiny amounts of glucose, keeping the level sufficient for growth but below that threshold. For us, it's inevitable, but a stir plate will ensure as much oxygen as we can supply at the start and will keep yeast in suspension and in contact with the medium for rapid growth and fermentation. Your call. Sorry, I kind of dragged us into the weeds. The Crabtree Effect just tells us that certain types of yeast will (mostly) ferment rather than respire when sufficient glucose is present, regardless of the presence of oxygen. This is what is going to happen in your starter; reducing or adding more oxygen isn't going to change that. Yeast still use oxygen to build up reserves of compounds that are shared with daughter cells during reproduction (and which could eventually limit the number of growth cycles), so providing sufficient O2 is still important. Looks like we’ve added some family members to the starter. I’m building it up again today and then I’ll probably do one more build up before the final pitch. I tasted some of the decanted wort and it seemed fine. No noticeable off flavor. That helps. The last time I took a biology class was high school and I dropped out of high school so. Not really bio savvy. I read all this technical jargon and was like “still don’t get it”. On the last starter I do I think I’m going to let the starter ferment a bit and use the fermenting starter as my pitch. When I’ve been aerating and turning the starter off at night there has been a slightly larger yeast cake, but no signs of fermentation. Usually my starters grow a layer of head/foam. Why might that be? Is it the large presence of oxygen inhibiting fermentation in the starter?